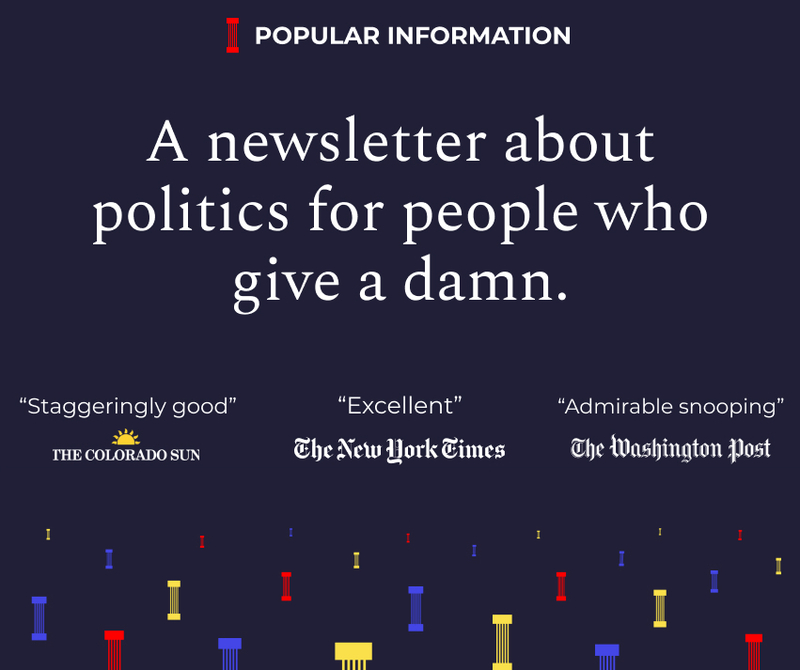 Welcome to a bonus edition of Popular Information, a political newsletter for people who give a damn — written by me, Judd Legum. In just a month, we’ve been able to dive into a bunch of fascinating issues -- from horse race polling to wage stagnation from child separation to Jared Kushner’s tower from hell. We are just scratching the surface, and I’m confident it can continue to get better, particularly with all the feedback I’m getting from readers. (Hit me up anytime at judd@popular.info). But I need a little help from you. One of the reasons I started Popular Information is my conviction that we need sources of accurate and unflinching political information that are not filtered by colossal tech companies like Facebook. But content that lives on social networks has an advantage because those platforms are optimized with algorithms and other tools for sharing. Email doesn’t have an algorithm. So if Popular Information is going to grow, it requires readers like you to take direct action. I have a simple request: If you like this newsletter, tell people about it. Forward this email to a few friends and encourage them to sign up. Text your mom and tell her to subscribe at popular.info. You could even let someone know about Popular Information in face-to-face conversation. In David Allen’s classic productivity book Getting Things Done, he argues that if a task takes less than two minutes, it’s better to do it right away. You’ll waste mental energy trying to remember. This will take less than two minutes, so there is no reason to procrastinate. I started Popular Information because I believed there was a real need for alternative ways to sort through the political chaos of 2018 and beyond. It’s been awesome to realize, in just a short time, how many thousands of people agree. Thanks for reading and taking this journey with me. Trump’s longtime personal attorney, Michael Cohen, stood in a federal courtroom on Tuesday and said, under oath, that he conspired with the president to commit two felonies. Simultaneously, Trump’s campaign manager, Paul Manafort, was convicted by a jury of eight felonies, including bank fraud and tax fraud. These developments, along with the ongoing Mueller investigation, threaten Trump, his family, and his businesses. On Thursday, Trump and his allies made a series of statements that taken together outline a clear plan to kneecap the Mueller investigation. After the upcoming midterm election, Trump would oust Jeff Sessions and ram through a new “loyal” Attorney General through the Senate. Currently, the Mueller investigation is overseen by Deputy Attorney General Rod Rosenstein because Sessions recused himself from the Russia investigation. The new Attorney General would have authority over the Mueller investigation and would be able to bring it to a swift and anti-climactic conclusion. Trump began the day by trashing his current Attorney General, Jeff Sessions, on Fox & Friends. "I put in an attorney general that never took control of the Justice Department. Jeff Sessions never took control of the Justice Department and it's a sort of an incredible thing," Trump said. Sessions’ original sin, in Trump’s view, was recusing himself from the Russia investigation, which ultimately enabled his deputy, Rod Rosenstein, to appoint Mueller. “Even my enemies say that Jeff Sessions should have told you that he was going to recuse himself and then you wouldn't have put him in,” he said. Trump attacking Sessions is not new. But normally, Sessions just takes lumps. Today, surprisingly, Sessions defended himself. I took control of the Department of Justice the day I was sworn in, which is why we have had unprecedented success at effectuating the president’s agenda – one that protects the safety and security and rights of the American people, reduces violent crime, enforces our immigration laws, promotes economic growth, and advances religious liberty. While I am attorney general, the actions of the Department of Justice will not be improperly influenced by political considerations. I demand the highest standards, and where they are not met, I take action. Sessions’ statement suggests that he knows his days as Attorney General are numbered. He’s now focused on defining his legacy rather than smoothing things over with Trump. Senator Lindsey Graham said Thursday that he expected Trump to remove Sessions “sooner rather than later” and that such a move was justified. The president’s entitled to an attorney general he has faith in, somebody that’s qualified for the job, and I think there will come a time, sooner rather than later, where it will be time to have a new face and a fresh voice at the Department of Justice. Clearly, Attorney General Sessions doesn’t have the confidence of the president. Graham said that he would support Trump removing Sessions after the midterm elections because doing so sooner would “create havoc” and imperil the Republicans chances’ on election day. Graham’s statements were a significant shift from his position just a year ago when he warned Trump there would be “holy hell to pay” if he removed Sessions. Senator Chuck Grassley, the chairman of the Judiciary Committee, said in an interview that “he’d be able to make time for hearings for a new attorney general.” Previously, Grassley said the committee was too busy for such a hearing. “I do have time for hearings on nominees that the president might send up here that I didn’t have last year,” Grassley said. Some Republicans, including Senators Thom Tillis (NC), John Cornyn (TX) and Susan Collins (ME), are not enthused about the prospect of Trump ousting Sessions. But Trump could nominate someone that would be hard for any Senate Republican to oppose, like one of their fellow senators. The statements by Trump, Graham, and Grassley could also be a bluff intended to pressure Mueller to complete his investigation soon. Mueller might not want to take the risk of the impact a new Attorney General could have on his work. The president’s lawyer, Rudy Giuliani, has been pressuring Mueller to finish his work by September 1. In addition to the plan to assert control over Mueller, Trump also telegraphed his intention to reverse the damage that Mueller has already done. In his interview with Fox & Friends, Trump said that “one of the reasons I respect Paul Manafort so much is he went through that trial.” Trump praised Manafort for not “flipping” and suggested that cooperating with the government should be illegal. Giuliani told several media outlets that he had talked to Trump in June about a possible Manafort pardon and convinced him to hold off until after the conclusion of the Mueller investigation. The message to Manafort: Hang in there because help is on the way. The prospect of a pardon could make it easier for Manafort to hold firm rather than cooperate with the special counsel. A joint status report submitted to a federal court late Thursday revealed that 528 children, including 23 children under the age of 5, remain separated from their parents due to Trump administration policy. The parents of most of these children were deported back to their home countries without any plan for reunification. The government is not even planning to attempt to reunite these families until the ACLU, the plaintiffs in the case, locate the parents and ask them if they want their children back. At the beach? Buried under a mountain of work? Here are the four regular editions of Popular information that you might have missed this week. THURSDAY: What’s next for the most powerful unindicted co-conspirator in the world? @JuddLegum just a note of thanks for Popular Information. It’s like a really smart friend has taken me aside in the middle of a loud, drunken party to calmly explain everything that confuses me about the world.